Sunday brunch works best when it offers a comfortable setting from which to stretch one's weekend a little bit further and deny ever so briefly that inevitable onslaught of Monday morning blues. If the food's good too, then all the better. 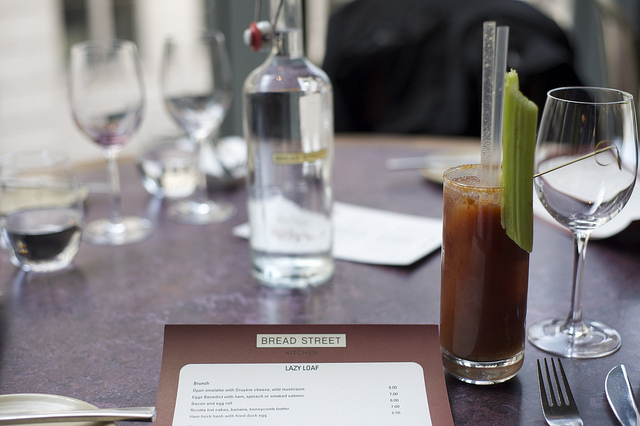 Bread Street Kitchen's newly launched Lazy Loaf Sunday Brunch achieves sumptuous success providing the right vibe and menu for pressing pause before the impending week ahead commences. A menu featuring a best of breakfast line up along with some Sunday roast favourites; a bloody Mary centric bar; a relaxed jazz and soul soundtrack performed live in a massively multi-storey yet nonetheless intimate setting. These are elements of “ah” and splendid procrastination. And the Lazy Loaf doles 'em out with near expertise. Still, reality does seep into the experience from time to time. Prices are perhaps a tad steep but not shockingly so. Starters and “brunch” items cost from £6. Mains are from £12. Sides are £3.50. It can be kind of confusing trying to figure out if a “brunch” dish is just a breakfast-y starter or if it would be substantial enough to eat on its own or as a main. Servers (ranging in style from incredibly charming and helpful to lackadaisically out of sync) are, thankfully, patient enough to work through a read of what's what. More bacon (as an add-on to brunch dishes) would probably be an appreciated menu enhancement. Minor grumbles aside, there are some delectable reasons to give the Lazy Loaf menu a go. 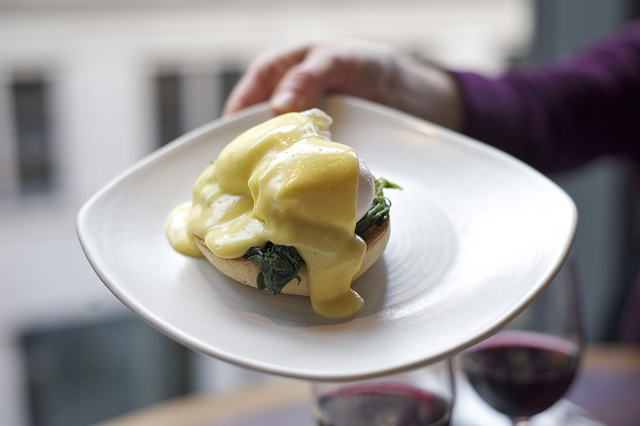 Eggs Benedict (with ham, spinach or smoked salmon, £7) is perfectly worthy of repeat visits. 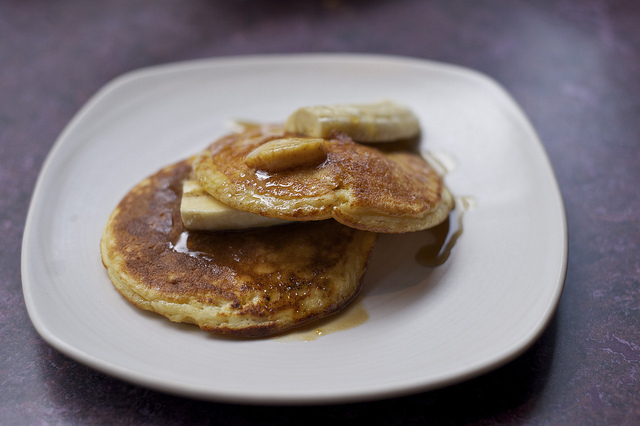 Ricotta hot cakes with banana and honeycomb butter (£7) salutes one's sense of indulgence without over doing it. 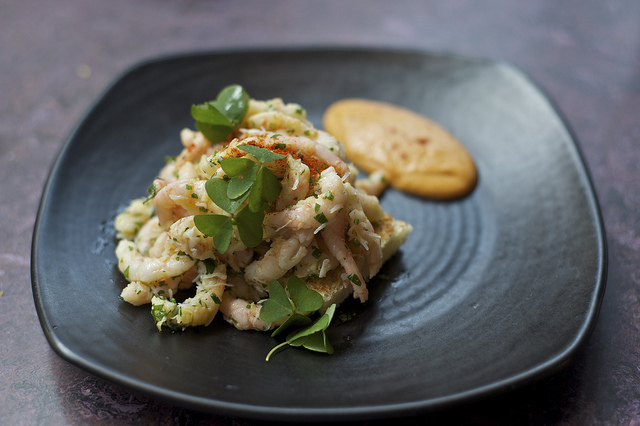 Saltwater prawns and crab on toast (£12) is as prettily presented as it is moreishly agreeable to devour. Sides are yummy value. Carrot and red onion coleslaw is a pleasure. Macaroni cheese with garlic-roasted crumbs is tasty too (but it comes across as much more béchamel-y than one might expect). Puds are a treat. Chocolate tart with salt caramel ice cream and honeycomb (£7) is an obviously popular choice and does not disappoint. Iced yoghurt with a choice of toppings (£7) refreshes. The cocktail list delights more evenly than the food menu. Well, that is, as long as you like bloody Marys. 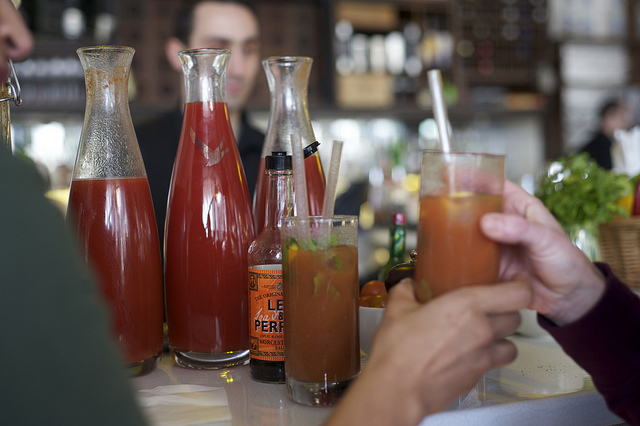 Indeed, it's hard to beat an £8 chance to “concoct your own perfect” DIY bloody Mary “from an array of ingredients at our Bloody Mary buffet”. And for the omnivorously curious epicurean, a Surf & Turf Mary (£8) with Grey Goose, BSK oxtail broth and clamato juice presents a sort of liquid BBQ that's peculiarly savoury. A few functional hiccups aside, Bread Street Kitchen slices a Lazy Loaf brunch that's worth recommending. Bread Street Kitchen is located at the south east corner of One New Change shopping centre, 10 Bread Street, EC4M 9AB. The Lazy Loaf brunch is available every Sunday from 11am to 8.30pm.